Well, we are two different people, who got raised in two different traditions (and cultures) and we like different things. In the beginning I had to make a double effort to feed Cookies the way he got used to (thankfully his Mom liked a lot of polish dishes like bigos (hunter’s stew), pierogi, haluszki, which actually he makes much better than I do etc). For example, when I wanted my favourite sour pickle soup, I was cooking bouillon and dividing into 2 pots and in one making pickle soup for myself and in the other tomato soup for Cookies. Thankfully as the time passed he started eating more and more, of course it works both ways, though I will NEVER EVER NEVER EVER eat cooked peas and corn with ketchup!!! So, with this long beginning just wanted to say, that sometimes I feel for something old school, which my Mom cooked when I was a kid. 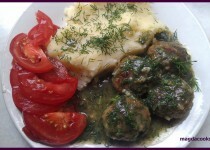 The other day it was little meatballs in dill sauce gravy. Toss the meat to the bowl, add oil, egg and spices, mix thoroughly but not too long, make small meatballs - or big ones ;-). Fry them in the skillet with wide bottom or in a deep frying pan. In the meantime prepare gravy. In a small skillet boil water with bouillon cube. Chop dill tiny. Add flour to the cold water and mix good. Spice the bouillon with pepper and add dill and flour/water mix, stir it good so the flour won’t clump. Boil another minute and pour onto the fried meatballs, stew another 2-3 minutes, max 5 minutes. Serve with mashed potatoes or buckwheat groats or just groats. I wanted real oldschool, so I went for potatoes. 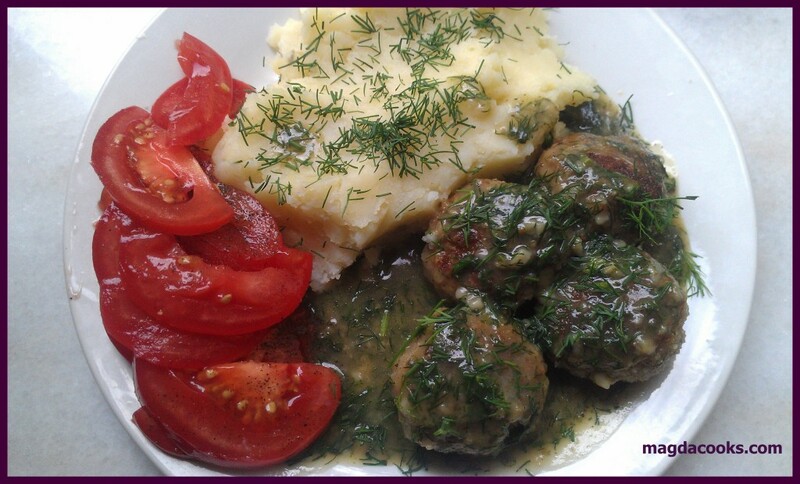 And don’t forget about salad: any will do, but fresh ripened tomatoes just underlined the meatballs dill aroma. PS. Cookies thoughts: Its ironic, cause as someone that doesn't like “GRAVY”, good OL, Magda Cooks, makes some of her “signature meals”, with, gravy… yeah, anyway, this was yet another from left field, type of deal, and on this day, IT WORKED well… and I got to say, Magda Cooks… it just right!